We are super stoked to be involved in the Nike SB Girls Only Christmas Skate Jam at Bay Sixty6 Skatepark in London next month. The event will take place of the regular monthly girls session kicking off a little earlier at 7pm. Lucy Adams & Shelley-Georgia Yates are on the mic to throw out presents for tricks and we’ve got our own prize for the best/worst! christmas jumper… so get digging out all of those awful knitted gifts from yer Gran! We’ve got some amazing skaters coming along so bring some friends as spectators get in free! Boards and safety gear are available to hire, as well as some light coaching if prior arrangements are made, (there are contact details in the press release below for this). Props to Miss Helena Long for the poster design! 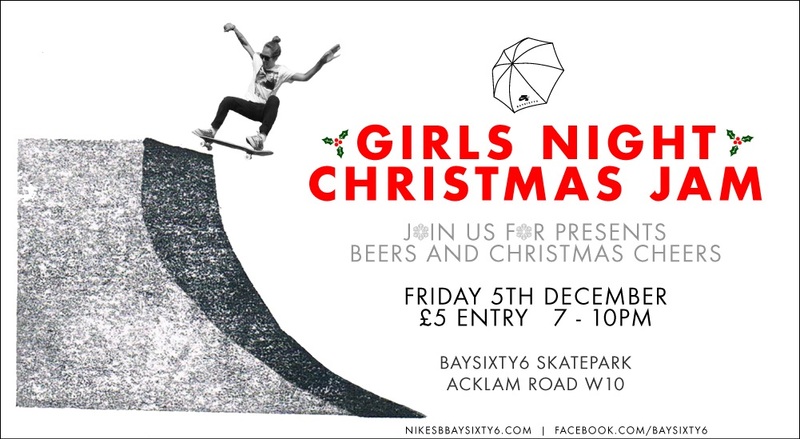 “5th December Nike SB BaySixty6 skatepark will be hosting The Girls Only Christmas Skate Jam, in association with Girl Skate UK. With some of the UK’s most progressive female skaters taking part including Lucy Adams, Josie Millard, Helena Long and Lois Pendlebury, London’s most iconic skate park will host London’s most important girls skate event of the year. For those new to skateboarding, board and protective gear is available for free hire as well as instruction by arrangement. Come and shred from 7-10pm where drinks and food will be available alongside a ‘Tricks for Christmas Presents’ jam on the mini ramp and street course for those taking their skating to the next level. The night costs just £5 entry – spectators are free. Don’t miss out on an evening of Christmas skate cheer with the girls. We can’t wait to see you all there, in the meantime take a look at our video from the September girls night below!